So, I decided to emulate a nail art design from The Beauty Department. Here's their version and it isn't that difficult. You need the nail tools and patience (the latter which I don't have much of). And here's my lame attempt. I don't have a white nail polish (the horror? I don't know) so I used the lightest color available. I don't have a dotting tool either (haven't seen one in Dubai) so I used a toothpick to achieve the polka dots. It's quite simple to achieve this. It's like a French manicure with polka dots. 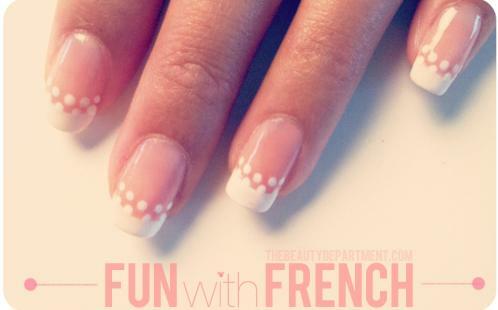 All you have to do is paint the tips of your nails as in the French mani. Take a dotting tool or toothpick or whatever is easy for you and dot the first line followed by the second. You can seal it with a top coat although I didn't (no patience, remember?). You can try this with any color, not just light ones.